Apple's upcoming 2018 iPhone models will not support the Apple Pencil because it does not offer a "good user experience," according to respected Apple analyst Ming-Chi Kuo who shared the information in a note sent out to investors. Kuo believes that Apple will announce the three new iPhones expected in 2018 during the week of September 9, which is in line with other rumors that have pointed towards a September 12 unveil date, a September 14 pre-order date, and a September 21 launch date. The 5.8 and 6.5-inch OLED iPhones will be available in September, says Kuo, but the 6.1-inch model, which has reportedly been plagued by production issues, will be available "slightly later due to its production schedule." Kuo expects both the 6.1 and 6.5-inch iPhone models to offer both single and dual-SIM versions, with the dual-SIM models to be available in specific markets like China. Kuo's information is in line with details shared by Bloomberg this morning. The 5.8-inch iPhone will not offer dual-SIM support, but Kuo says it could include an e-SIM as well as single-SIM functionality. Kuo is not certain, however, if the e-SIM will be activated. 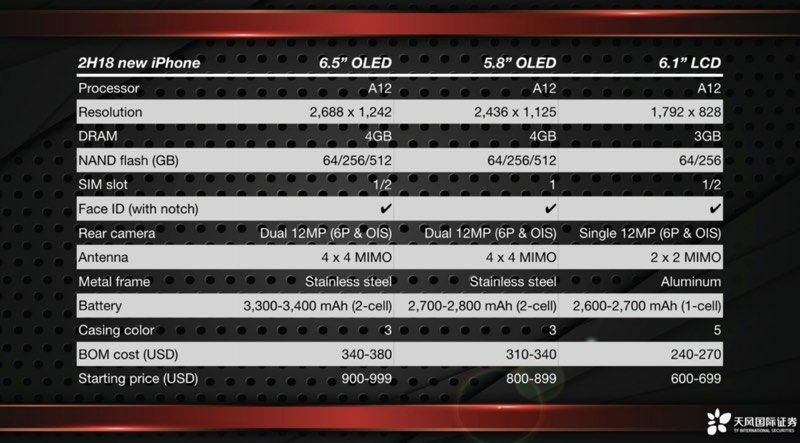 The 6.1-inch model will also be limited to a 2X2 MIMO modem while the two OLED devices will get faster 4x4 MIMO modems, but it will be available in a wider array of colors. 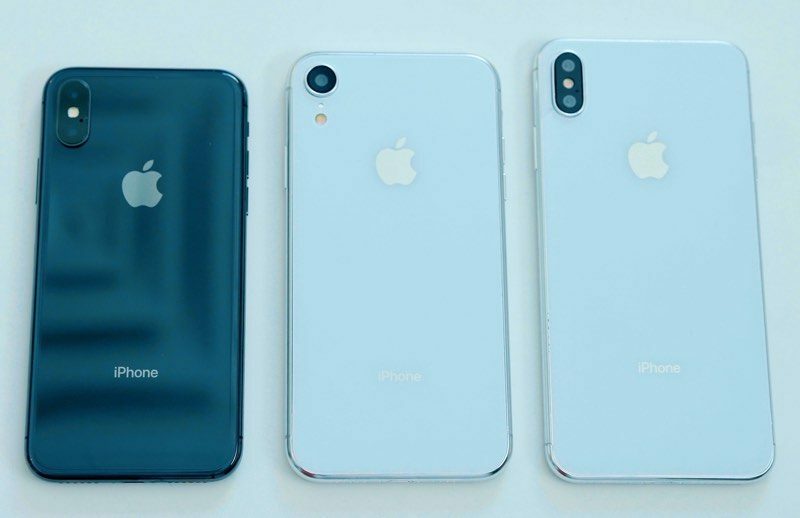 Kuo has previously said that he expects the 6.1-inch iPhone to be available in red, blue, orange, gray, and white, while the 5.8 and 6.5-inch iPhone models will be available in three colors, presumably silver, space gray, and gold. All three models, including the lower-cost 6.1-inch iPhone, are expected to include support for the new A12 chip, as the 6.1-inch iPhone is meant to be a followup to the iPhone 8. Apple's iPhone 8, iPhone 8 Plus, and iPhone X all use the A11 chip. Kuo expects the new 6.1-inch LCD model to account for 50 to 55 percent and 65 to 70 percent of new iPhone models' total shipments in the second half of 2018 and the first half of 2019, respectively. The new 6.1-inch iPhone will "increase replacement demands" compared to iPhone X and iPhone 8 because of its price tag, which Kuo expects to be between $600 and $699. As he has said in the past, Kuo believes Apple will price the 5.8-inch OLED iPhone at $800 to $899 and the 6.5-inch OLED iPhone at $900 to $999. I'm sure but why would you want Apple Pencil support on an iPhone? Very few people would be using the Apple Pencil with their iPhone. It makes sense on an iPad, not iPhone. Sure the cheaper one is delayed due to production and has nothing to do with cashing on on impatient people who will buy the more expensive models that are shipping sooner. Why? This makes no sense. Just because the Apple Pencil is supported for use, doesn’t mean you have to buy and use one. Who wants a stylus? You have to get them and put them away, and you'll lose them. Yuck! Nobody wants a stylus. It's looking like I will keep my iPhone X and wait for next year's model. So the 6.1” is going to have a LOWER resolution than the smaller and older iPhone 8 Plus model?!? I don't doubt it, but I get so frustrated that I need to buy a bigger iPhone to get the best camera. I just don't want that gigantic phone, but I do want the best camera possible. 3) Apple wants camera nuts like me to buy the biggest model, which gives them the most money (see 2 above). The LCD model doesn't even get 1080p in 2018? Jeez Apple. Adding a stylus to an iPhone when Steve specifically said "No" would be the ultimate snub to his legacy. That ship sailed years ago.